PGA Tour commissioner Tim Finchem reportedly made more than $5 million in 2009. Incomes for PGA teaching pros vary depending on the club or course where they work, and whether their facility is public or private. Additionally, PGA club pros can earn extra money playing in local tournaments. Head pros typically earn from $65,000 to $75,000 per year, and assistant pros about $40,000 annually, according to Ohio State University. 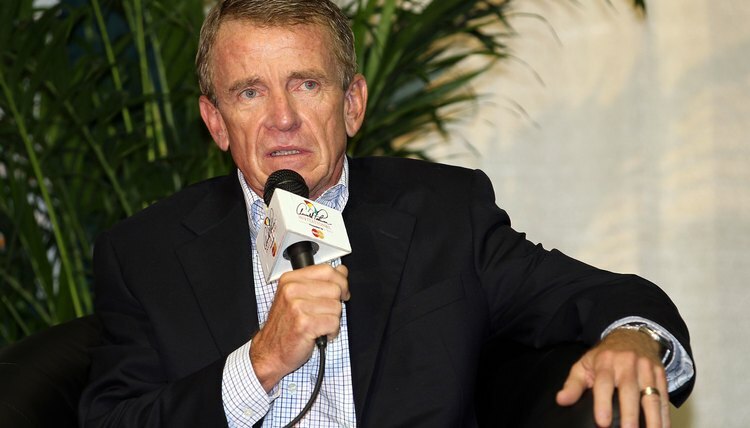 The most highly-paid golf executive, by far, is PGA Tour Commissioner Tim Finchem. Finchem, who has had the job since 1994, signed a 4-year contract extension in 2012. While his salary wasn’t disclosed, “Golf Digest” reported in 2011 that Finchem received more than $5.1 million in compensation in 2009. His base salary was $4.7 million, according to Bloomberg.com. Finchem’s total income would have placed him fourth on the 2009 PGA Tour's money list. His LPGA counterpart, Carolyn Bivens, received just over $880,000 in 2009. In addition to Finchem, five other PGA Tour executives earned more than $1 million in 2009, according to “Golf Digest,” led by co-chief operating officers Ed Moorhouse and Charles Zink, who each earned more than $1.5 million. Sixteen other PGA Tour officials made at least $312,000. Joe Sterenka, CEO of the PGA of America, received $840,000 in 2009, while six more PGA officers earned at least $300,000 apiece. United States Golf Association executive director David Fay earned $773,000. LPGA Tour deputy commissioner Elizabeth Galloway made $315,000 in 2009.